A broad-based relief rally helped Canada's main stock index close at a record high Thursday after markets retreated globally a day earlier, while U.S. stock markets also pushed higher. The Toronto Stock Exchange's S&P/TSX composite index closed up 150.10 points or 0.91 per cent at 16,567.42 to top the record high set on Tuesday. It also set an intra-day trading high of 16,577.06. Volume at 4 p.m. ET was 247.46 (m) million shares. All 12 subgroups closed higher, led by information technology, adding 2.47 points, or 2.96 per cent, to 85.85 points. The gains came a day after markets fell following the release by the U.S. of a list of US$200 billion in Chinese goods that could be hit by tariffs, against which China promised to retaliate. "The markets had gotten quite negative over trade tariffs and trade tensions," said Anish Chopra, managing director with Portfolio Management Corp.
Trade uncertainty has helped keep various sectors down, but all major indexes on the TSX showed gains Thursday in something of a relief rally, said Chopra. "We haven't had the TSX up across all sectors in quite a while simply because of the news flow that we've had related to trade and economic growth in countries including Canada." 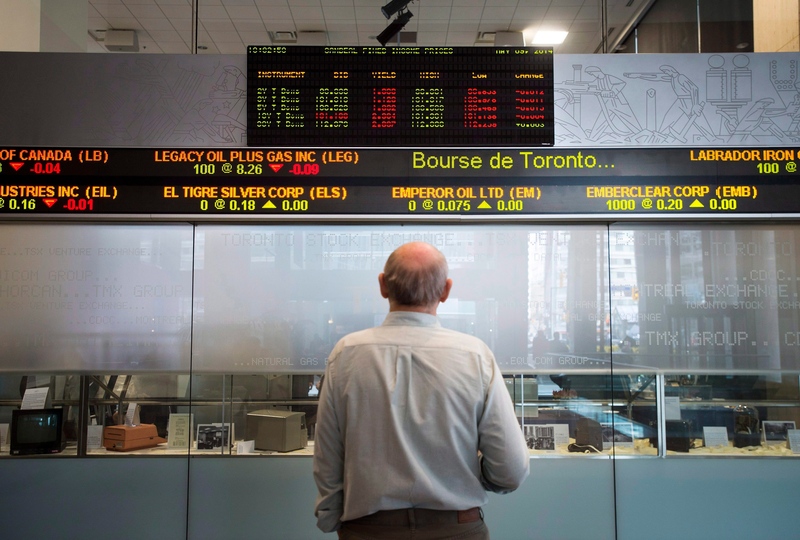 The S&P/TSX information technology index had the highest gains with a 2.96 per cent climb, while energy, base metals and financials showed gains of under one per cent. He said the possibility of talks between China and the U.S. at an upcoming G20 meeting could have helped ease tension on the market. Which of these TSX leaders has the most room to run higher? In New York, the Nasdaq composite index closed up 107.30 points or 1.39 per cent at 7,823.92 to also set a record high. The Dow Jones industrial average closed up 224.44 points at 24,924.89 and the S&P 500 index closed up 24.27 points at 2,798.29. The Canadian dollar averaged 75.95 cents US, down 0.09 of a US cent. The loonie had an early boost Wednesday from the widely-expected rate hike from the Bank of Canada but has slipped on stronger U.S. economic data. The August crude contract closed down five cents at US$70.33 per barrel and the August natural gas contract was down three cents at US$2.80 per mmBTU. The August gold contract ended up $2.20 at US$1,246.60 an ounce and the September copper contract was up three cents at US$2.78 a pound. Hydro One Ltd. closed down 65 cents or 3.22 per cent at $19.52 a day after the CEO retired and the board of directors resigned en masse. Ontario Premier Doug Ford had made it a campaign promise to fire CEO Mayo Schmidt over high utility rates. The utility, partially owned by the province, said a new board of directors will be selected by Aug. 15 and will initially consist of 10 members.